It’s not entirely clear where it started. The first time I heard the word ‘Morrissey’ was on the radio in my parent’s car. The charts were on, so it would have been a Sunday, and the DJ – an unhung one – was talking about the freshly released Suedehead, which as any Morrissey fan no is his first single. As I was 11 I went on to pay some, but little attention to Everyday is Like Sunday, Last of the Famous International Playboys and other classics from the early solo canon at the time of their release. One day, aged 14 or so, I must have expressed an interest to the right person as Mandy Smith, a girl in my class, handed me a copy of Strangeways, Here We Come, the final Smiths album. From here I was sold – everything by the Smiths and Morrissey gathered up on vinyl on happy Saturdays ferreting round London’s record shops. Morrissey posters replaced anything else on the wall of my teenage bedroom. Concerts, fanzines, terrible teenage poetry, queuing to get my copy of Vauxhall & I signed at HMV in Oxford Street on March 14, 1994. Invading the stage at Ilford Island (oh the glamour) on the Boxers tour. Defending Morrissey like I’d defend my own family and Arsenal Football Club.I had, and have, ‘a thing’ for Morrissey. It wasn’t that I was melancholy teenager, far from it, in fact I loved the humour and wit in is lyrics and the way many songs rocked along. Down the front at a Morrissey concert remains sweaty, bouncy fun and a chance to sing the ‘Mor-ris-sey’ football-style song. Therefore I approach Autobiography from a different angle to most. Not for me any worries about the odd indulgence of Penguin publishing it as a classic. After all, in life there is one rule for Morrissey and one rule for everyone else. No real concerns, either, at what unknowns may become known. With Morrissey the more you expect to learn, the less you find out and the enigma grows. This was one life story that surely would not be warts and all. Most of all this was something of a unique opportunity for 480 pages of enjoying the singer’s prose, a welcome break from more recent albums which have been off-form, or maybe just aimed at a different audience. Here, then, are some reflections on the book. 1. It’s (mostly) a great read. 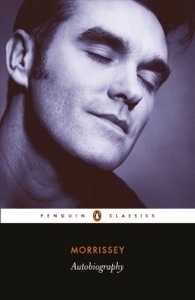 Morrissey writes beautifully and in a way that makes no attempt to hide that he is, in his words ‘a bit much’. The journey from underwhelming and at times brutal schooling in Manchester to his iconic status is not a smooth procession to victory. It is awkward, haphazard and filled with regret at many things, especially the friends he has lost along the way. But it is also very funny, full of wit like his songs and the pages skip by happily. In one passage pot-holers are lambasted for the hidden desire Morrissey believes they all share to fall in, so they can appear on the news. This is one of many examples of unexpected targets who get a roasting. Think Bryan Ferry’s safe after Morrissey writes adoringly of Virginia Plain? Think again – by 1987 he’s winking at Johnny Marriage and dubbed ‘full of sherry’. Tony Wilson, Mancinian grandee? Grasping schemer straight out of Twenty Four Hour Party People more like. Morrissey is vague about this most interesting of incidents almost to the point of amnesia. It reminded me a little of a running in Asterix books where none of the Gauls can remember what happened at Alesia, where they took a pummelling from the Romans. Every Gaul professes to not even know where Alesia is, and so it is with the events of 1986-7. Gradually they seem to slip away. Maybe they did. Apart from some scant details on certain songs there’s an almost wilful exclusion of detail on what was, by all accounts, a near-spiritual songwriting process for Morrissey and Marr. I’d have loved more detail on that, and how that changed with Stephen Street for Viva Hate or Mark Nevin on Kill Uncle. And as other reviewers have pointed out, Boz Boorer is a very important figure in Morrissey’s career. There’s enough left out for a book devoted to Smiths recordings and his approach to them and views on them, and one on solo recordings too. More please! I was amazed at how open Morrissey was about his relationships in one way, but leaves much to be interpreted. I thought this was very sensitive and quite a gentle way to parry the vulgar prying into one’s private life that the media demands. After all, what would further peeling back the curtains do but expose and hurt those mentioned? You can’t help but remain curious about some other key characters in Morrissey’s career: Boz Boorer in particular remains an enigmatic figure. Alain Whyte, responsible for some of Morrissey’s best solo songs gets a mixed write-up. Stephen Street barely exists, yet look what they did together.